Rubber speed cushions are a great alternative to speed bumps, they offer a longer smoother ramp that still requires a vehicle to slow down. 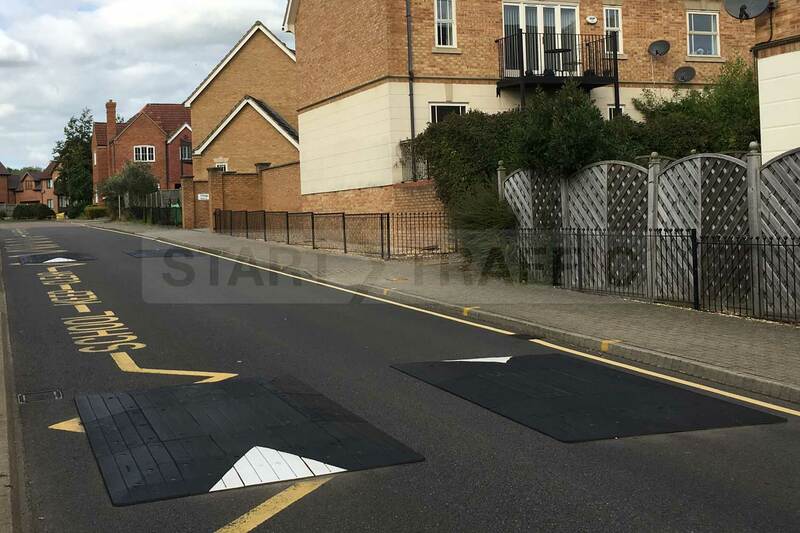 Our bolt down speed cushions are easy to install, ultra hard wearing (even suitable for use on the public highway) and are made from recycled materials. Our speed cushions are modular in construction and supplied as kits including reinforcing bars and fixings. The kits can be supplied in almost any size, this kit is for a 2m long x 1.6m wide x 65mm tall kit. Other sizes are available all you need to do is call our sales team on 01905 794 875. Being made from rubber these ramps absorb energy from the passing vehicle, making them quieter and less abrupt than harder materials such as concrete or tarmac. Modular construction means no heavy lifting is required. Ultra Hard Wearing - Built for use on the public highway, so is, therefore, ultra strong and designed to withstand years of use by all vehicle types. Consistent Finish & Quality - Over 30,000 units have been supplied worldwide, and the process has been fine-tuned to give a consistently high-quality product reliably. Easy Installation - Requiring only drilling and bolting down these kits take no time at all to install. 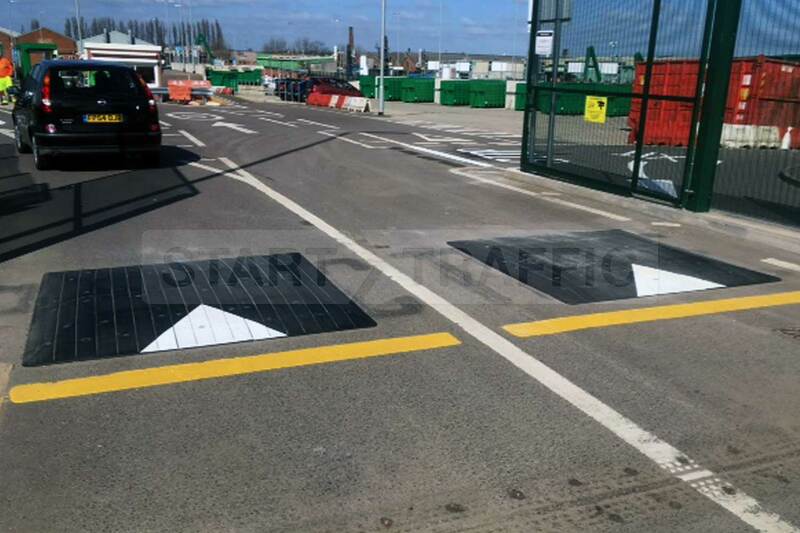 Uniform Shape - Unlike tarmac, you can be sure that the ramp will be the correct size and shape and won’t scrape cars, emergency vehicles and buses. Highly Versatile - Almost any kit size can be created for any width of the road. Call us to discuss your needs and arrange a site survey today. Surface Mounted - No excavation, adhesives or waste material needed or produced. The speed cushion can be opened to traffic almost immediately. Made From Recycled Material - Made from old tyres these ramps are good for the environment as they use what would otherwise end up in a landfill site. They are also made in the UK reducing fuel consumption! Supermarket & Shopping centre car parks - Keep traffic to a sensible speed where pedestrians are present. School Zones - Enforce the speed limit in school zones keeping children, parents and everyone safe. Airports - Keep vehicles travelling around the grounds at a controlled speed. Ports & Distribution Centres - Keep HGV’s and other large vehicles at a sensible speed for the site. These hard wearing ramps are ready for the job. Not sure what and where to put them? Give our sales line a call on 01905 794 875 and speak to one of our speed cushion advisors, they will be able to arrange a site visit and survey to ensure you are getting the right product for your needs. Don’t know a spanner from a hammer? If you need help installing your speed cushions we are also able to recommend an installer for you. Contact our sales team to discuss this requirement before purchasing your ramp. Looking for speed bumps or speed tables? Not looking for rubber speed cushions? Maybe you need speed bumps, or speed tables, whatever your needs are our sales team are happy to help you get just what you need for your site. Give us a call today, or drop us an email through our contact form. We will normally get back to you within the hour during office hours.